Patellar Tendonitis Treatment: Do You Know These Secrets? Are you struggling to get rid of your pain? Patellar tendonitis treatment can be extremely frustrating and according to academic research, it may last up to 15 years, especially without the right approach (Kongsgaard et al. 2009). 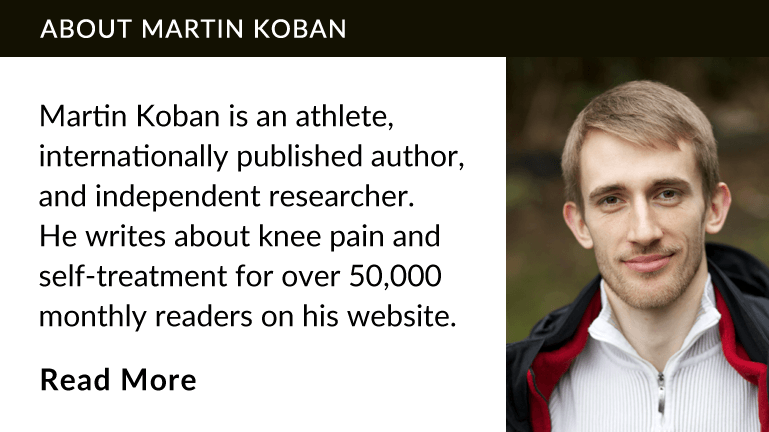 Read this article to learn the secrets I discovered through treating my own patellar tendonitis and helping countless readers with this injury. Did you take anti-inflammatories for your patellar tendonitis? Bad news: you may have made things worse! According to Australian researcher Dr. Jill Cook, using non-steroidal anti-inflammatories such as ibuprofen can be a treatment option in the early stages of tendonitis, but it slows tendon repair once your injury has become chronic (Cook, Purdam 2009, p. 413). In other words, if you have the pain for the very first time in your life and it hasn’t lasted longer than two or three weeks, you may use anti-inflammatories to treat your patellar tendonitis. You have to stop your training during that time and take a few weeks to ease back into it after your treatment has concluded. 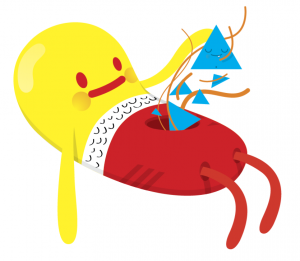 BUT, if you’ve already had patellar tendonitis several times in the past or you’ve been in pain for more than a month, you’ve progressed into the chronic injury stage and academic research says that taking Ibuprofen or other NSAIDs will slow down your healing (or even prevent healing altogether). Anti-inflammatories slow down soft-tissue adaptation, which means it takes your tendons longer to grow stronger in response to physical training or rehab exercises. Consequently, your risk of soft-tissue injuries such as tendonitis increases when you’re taking anti-inflammatories. It took me a long time to understand that even with the very best exercise program full recovery still takes months. I’m not talking about being mostly pain-free. I’m talking about being completely pain-free and stronger than before your injury. Here’s why it takes so long. In chronic patellar tendonitis, the fibers inside your patellar tendon are out of alignment, which decreases the amount of force the tendon can handle. It’s like the threads of steel cable that has become frayed. Bad fiber alignment happened through a combination of excessive ballistic load (jumping and running), training too often, and bad motor control. To recover, you need to stop all activities that cause overload, go on a treatment plan based on slow strengthening exercises (more on that in a moment), and leave enough rest days between your rehab training. The tendon heals in response to your rehab training: it grows stronger after the exercise, not during. If you interrupt this adaptation process by training again too soon, you will prevent healing. How fast your tendon recovers is determined at the cellular level. You can influence this speed through your diet, lifestyle, and even medication. You can’t force faster healing by doing your treatment exercises and stretches very often or massaging your muscles more aggressively. The collagen fiber alignment inside your patellar tendon normalizes over MONTHS in response to slow strength training exercises. The stretches and massage merely help to reduce excess stress, which prevents more damage, but they don’t actually heal the tendon directly. Rest alone will not heal chronic patellar tendonitis. Slow strengthening exercises stimulate healing in your patellar tendon. Successful treatment for full recovery requires the right combination of training and rest. Stretching and self-massage help reduce excess stress on the tendon. You CANNOT force faster healing by doing the rehab exercises very often or very aggressively. 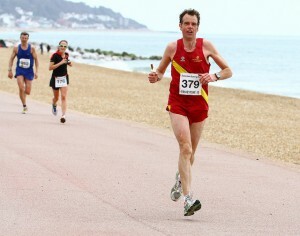 Readers often ask me how much time it takes to recover from patellar tendonitis. After years of helping people with this injury, I know that if this is the first question on your mind, your treatment will take longer. Here’s why. If you’re in a hurry to get rid of patellar tendonitis, you won’t give your body enough time to heal. As soon as your pain goes down, you’ll rush back into your sport and pain will promptly return. I made that mistake myself and after helping people with patellar tendonitis for many years, I know that it happens to almost everyone. The longer you stay in this vicious cycle, the more chronic your injury will become and the longer it will ultimately take to get rid of the pain. To break free from pain, you must be patient with your knees. If you rush back into being active, you will cause setbacks and add months to your healing time. Get comfortable with the idea that treating your patellar tendonitis is a challenge you have to master before you’re safe to go back to enjoying your sport. Academic research showed that in tendonitis, tissue damage occurs before you feel pain (Huisman et al. 2013; Khan et al. 1998, p. 351). In fact, of tendons so degenerated that they’re close to rupture, two thirds were still pain-free (Kannus, Józsa 1991). I can’t emphasize enough how important understanding this scientific fact is: being pain-free doesn’t mean your patellar tendon is healthy or strong enough for your sport! You MUST NOT trust your pain. Instead, only use pain as an indicator to find a combination of treatment exercises and rest days that allows you to reduce pain from week to week. Next, you continue with the same slow progression until your pain is completely gone. Finally, continue the same slow progression even further for at least a month or two after pain has already disappeared to make sure your tendon is strong enough for your return to sports. Return to your sport at a very low intensity and make sure to leave at least 3 rest days in between training sessions that are tough on your knees, because that’s how long it will take your tendon to adapt. Just because your tendon is pain-free doesn’t mean it’s strong enough for your sport. Use your pain to optimize the intensity of your rehab exercises. Continue your safe strengthening training for at least a month after pain is completely gone. In summary, to treat patellar tendonitis, you need to stop all activities that overload your tendon, such as running or jumping. After taking a week or two of rest, you can begin with slow strengthening exercises such as slow squats, if you’re in the chronic stage. To prevent patellar tendonitis from coming back, you need to work on problem areas in your body such as ankle mobility, hip mobility, strength of your gluteal muscles, as well as motor control. From my experience, I know that you probably haven’t heard about these hidden problems before, which may be the reason why you’re still struggling with patellar tendonitis. 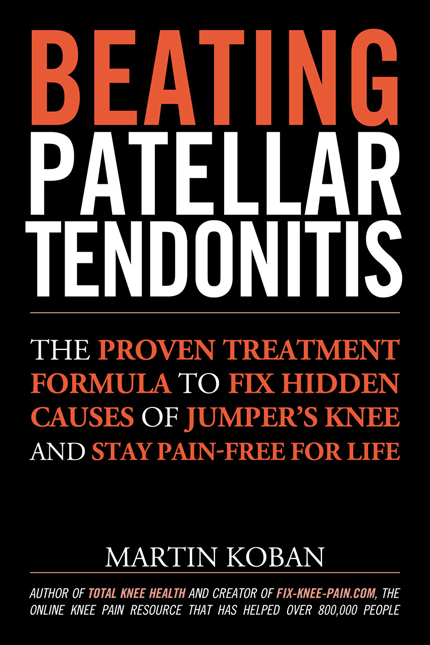 To help you get rid of your pain, I share the exercises you need to do to fix these hidden problems in detail in my free email course on patellar tendonitis. I’ll also send you the two most important chapters of my book Beating Patellar Tendonitis as a gift. Start healing your knees today: Get free instant access to my best treatment exercises for patellar tendonitis. Cook, J. L.; Purdam, C. R. (2009): Is tendon pathology a continuum? A pathology model to explain the clinical presentation of load-induced tendinopathy. In British Journal of Sports Medicine 43 (6), pp. 409–416. DOI: 10.1136/bjsm.2008.051193. Huisman, E.; Thornton, G.; Roberts, C.; Scott, A. (2013): IDENTIFICATION OF BIOMARKERS FOR EARLY TENDON DEGENERATION USING AN IN-VIVO RABBIT MODEL. In British Journal of Sports Medicine 47 (9), pp. e2. DOI: 10.1136/bjsports-2013-092459.57. Kannus, P.; Józsa, L. (1991): Histopathological changes preceding spontaneous rupture of a tendon. A controlled study of 891 patients. In J Bone Joint Surg Am 73 (10), pp. 1507–1525. Khan, K. M.; Maffulli, N.; Coleman, B. D.; Cook, J. L.; Taunton, J. E. (1998): Patellar tendinopathy: some aspects of basic science and clinical management. In Br J Sports Med 32 (4), pp. 346–355. Kongsgaard, M.; Kovanen, V.; Aagaard, P.; Doessing, S.; Hansen, P.; Laursen, A. H. et al. (2009): Corticosteroid injections, eccentric decline squat training and heavy slow resistance training in patellar tendinopathy. In Scand J Med Sci Sports 19 (6), pp. 790–802. DOI: 10.1111/j.1600-0838.2009.00949.x.